Activating Village Courts in Bangladesh project organized the 5th Project Reflection Workshop at the Officers’ Club, Dhaka on 16 February 2014. Together with selected participants from four partner NGOs (MLAA, ESDO, BLAST & WAVE Foundation) and R&PD areas, the one-day long workshop was graced with the presence of Mr. K. M. Mozammel Hoq, National Project Director and Additional Secretary, Local Government Division as Chief Guest while Ms. Won Young Hong, Assistant Country Director of UNDP and Ms. Shamima Nargis, Joint Secretary of LGD as Special Guests. Mr. Abu Tahir Muhammad Zaber, Deputy Secretary, LGD and Mr. Salahuddin Khan, Programme Analyst, UNDP were present, among others, in the day-long workshop with their valuable inputs and reflections. The entire workshop was facilitated by Mr. Sarder M Asaduzzaman, Project Coordinator of Activating Village Courts in Bangladesh Project. 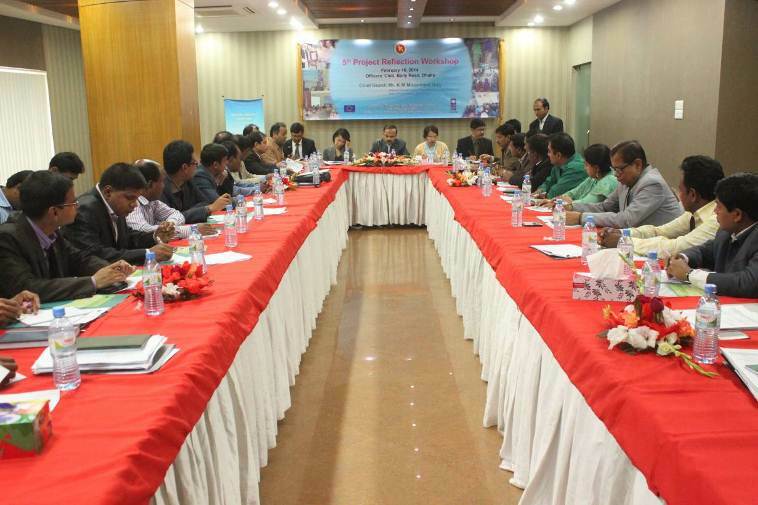 This periodical sharing and reflection workshop allowed participants to pick and exchange the achievements of the field activities with others in light of the amended VC Act 2013 as well as field level experiences on working strategies for project up to December, 2014, reporting system, coordination between the local government and the relevant government actors such as DDLG, UNO, district judiciary, police administration etc, sharing the VC performance and status of the progress. The Project Coordinator shared few observations for overcoming the challenges in administrative, financial as well as programmatic aspect. In his concluding remarks Mr. K. M. Mozammel Hoq, National Project Director and Additional Secretary, LGD mentioned that, ‘Activating Village Courts are an integral part of local government system. The project has created examples for other Unions across the country for activating village courts functions. He also emphasized on building relationship with district judiciary and administration which is crucial for making Village Courts service successful. Besides, the PRW-5 came up with some basic recommendations on functioning VCMCs, compensation realization process following UP Taxation Act etc.